Nintendo 3DS (იაპ: ニンテンドー3DS, აბრევიატურა 3DS) — პორტატული თამაშების კონსოლი, რომელსაც აწარმოებს იაპონური კომპანია Nintendo. 3DS-ს შეუძლია სტერეოსკოპიური 3D ეფექტის გამოსახვა ეკრანზე 3D სათვალეებისა თუ რაიმე სახის დამატებითი აქსესუარების გარეშე. ნინტენდომ კონსოლი დაანონსა 2010 წლის მარტს და ოფიციალურად დაადასტურა 2010 წლის E3-ის-ის კონფერენციაზე. ეს არის Nintendo DS-ის მემკვიდრე და კონკურენციას უწევს PlayStation Vita-ს. კონსოლი მომხმარებლებს სთავაზობს სიახლეებს: კომუნიკაციის სისტემები StreetPass და SpotPass, დამატებითი რეალობა, რომელიც იყენებს 3D კამერას და ასევე ვირტუალური კონსოლი, რაც იძლევა მისი წინამორბედი კონსოლების თამაშების გადმოწერისა და თამაშის საშუალებას. იგი ასევე აღჭურვილია სხვადასხვა აპლიკაციებით, მათ შორის არის: ონლაინ დისტრიბუციის მაღაზია Nintendo eShop, სოციალური ქსელი Miiverse, ინტერნეტ ბრაუზერი Netflix და ვიდეო ჰოსტინგის სერვისები, Hulu Plus და Youtube და ა.შ. კონსოლი პირველად გამოვიდა იაპონიაში 2011 წლის 26 თებერვალს, ხოლო მსოფლიოს მასშტაბით გაყიდვები დაიწყო 2011 წლის მარტის თვეში. 6 თვის შემდეგ, 2011 წლის 28 თებერვალს ნინტენდომ კონსოლის ფასი $249 დოლარიდან $169 დოლარამდე დასწია. კომპანია მყიდველს, იმ შემთხვევაში თუ კონსოლს თავდაპირველ ფასში შეიძენს, უფასოდ სთვაზობს Nintendo Entertainment System-ის და Game Boy Advance-ის ათ თამაშს, Nintendo eShop-ის მეშვეობით. ამ სტრატეგიის წყალობით კონსოლი გახდა პოპულარული და გაყიდვების კუთხით იგი იქცა ნინტენდოს ერთ-ერთ ყველაზე წარმატებულ პროდუქტად. 2016 წლის 30 ივნისის მონაცემით, 3DS-ის გაყიდვებმა 59.79 მილიონ ეგზემპლიარს მიაღწია . კონსოლის წარმატებამ განაპირობა მისი დიზაინის სახეცვლილება და 2012 წლის ივლისში გამოვიდა Nintendo 3D XL, რომელიც ორიგინალთან შედარებით არის ზომით ფართე და დიდი ეკრანი აქვს. 2013 წლის ოქტომბერში დასავლური ბაზრისთვის გამოიცა Nintendo 2DS, რომელსაც არ გააჩნია 3D ფუნქცია. New Nintendo 3DS-ს, გამოსული 2014 წლის ოქტომბერში, XL-ს აქვს გაუმჯობესებული პროცესორი, ანალოგის მეორე ჩხირი, დამატებითი ღილაკები, დახვეწილი კამერა და სხვა მახასიათებლები. ↑ Harris, Craig. (28 სექტემბერი, 2010) Nintendo Conference 2010 Details. IGN. წაკითხვის თარიღი: 26 სექტემბერი, 2013. ↑ Kaluszka, Aaron. 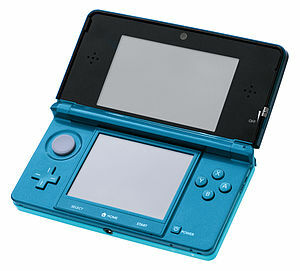 (19 იანვარი, 2011) 3DS North American Price, Date, Colors Set. Nintendo World Report. ↑ Supplementary Information about Earnings Release (PDF). Nintendo (29 ოქტომბერი, 2010). წაკითხვის თარიღი: 7 ნოემბერი, 2010. ↑ Daniel Vuckovic. (8 თებერვალი, 2011) Nintendo 3DS launches in Australia on March 31st for $349. Vooks.net. წაკითხვის თარიღი: 26 სექტემბერი, 2013. ↑ 5.0 5.1 Consolidated Sales Transition by Region (PDF). Nintendo (26 ივლისი, 2016). წაკითხვის თარიღი: 27 ივლისი, 2016. ↑ Top Selling Software Sales Units - Nintendo 3DS Software (June 30, 2016). წაკითხვის თარიღი: July 27, 2016. ↑ Tabuchi, Hiroko. “Nintendo to Make 3-D Version of Its DS Handheld Game“, The New York Times, The New York Times Company, 23 მარტი, 2010. წაკითხვის თარიღი: 4 აპრილი, 2010. ↑ Snider, Mike. “E3 2010: Nintendo 3DS unveiled“, USA Today, 15 ივნისი, 2010. წაკითხვის თარიღი: 26 ნოემბერი, 2012. ↑ Nintendo (23 მარტი, 2010). „Launch of New Portable Game Machine“ (PDF). პრეს-რელიზი. https://www.nintendo.co.jp/ir/pdf/2010/100323e.pdf. წაკითხვის თარიღი: 23 მარტი, 2010. ↑ Nintendo 3DS vs. PS Vita: Handheld Wars, The Next Generation. IndustryGamers (September 16, 2011). დაარქივებულია ორიგინალიდან - 29 აპრილი, 2012. წაკითხვის თარიღი: 1 ნოემბერი, 2011. ↑ Nintendo's 3DS Hits the U.S. On March 27 for $249.99. Kotaku.com (January 19, 2011). წაკითხვის თარიღი: 7 ივლისი, 2012. ↑ Nintendo's 3DS Hits Europe On March 25. Kotaku.com (19 იანვარი, 2011). წაკითხვის თარიღი: 7 ივნისი, 2012. ↑ Schroeder, Stan. “Nintendo 3DS Price Cut to $169 Amid Disappointing Sales“, Mashable.com, 28 ივლისი, 2011. წაკითხვის თარიღი: ~27 ნოემბერი, 2012. ↑ What Do You Think About Nintendo's Big 3DS Announcement?. IGN DS. IGN (28 ივლისი, 2011). წაკითხვის თარიღი: 26 სექტემბერი, 2013. ↑ McEntegart, Jane. “Nintendo 3DS XL Arriving in UK On July 28“, Tom's Hardware, 23 ივნისი, 2012. წაკითხვის თარიღი: 26 ნოემბერი, 2012. ↑ Yin, Wesley. Nintendo announces Nintendo 2DS handheld console • News •. Eurogamer.net. წაკითხვის თარიღი: 30 აგვისტო, 2013. ↑ New Nintendo 3DS And New Nintendo 3DS XL Announced, Are More Powerful — Siliconera. Siliconera (29 აგვისტო, 2014). წაკითხვის თარიღი: 30 აგვისტო, 2014. ↑ Nintendo’s new 3DS console hits shelves in Japan. Japan Times (11 ოქტომბერი, 2014). ეს გვერდი ბოლოს დარედაქტირდა: 22:54, 1 ოქტომბერი 2017.